Inspired by the natural beauty of Monkquell Wood, 'Shrine' is a literal reaction to the sacredness and timelessness of place, past, present and future. 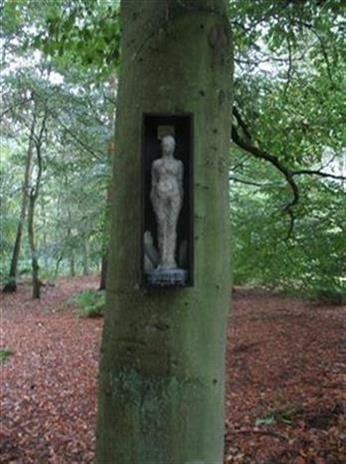 A wooden case housing a female figure resembles a wayside shrine, a universal symbol of worship and veneration. The figure is created from clay and covered in wax, representing the symbolic offering of candles placed within wayside shrines where the wax, left to drip, forms towers of furrowed wax. Set inside a wooden box the figure is surrounded by small objects, laid there to resemble tokens offered by nameless pilgrims reminding us of the rituals and ceremony we assign to cherished deities. Underpinning the work are questions aimed to challenge and investigate religious systems within our cultural traditions and as part of a common human experience. 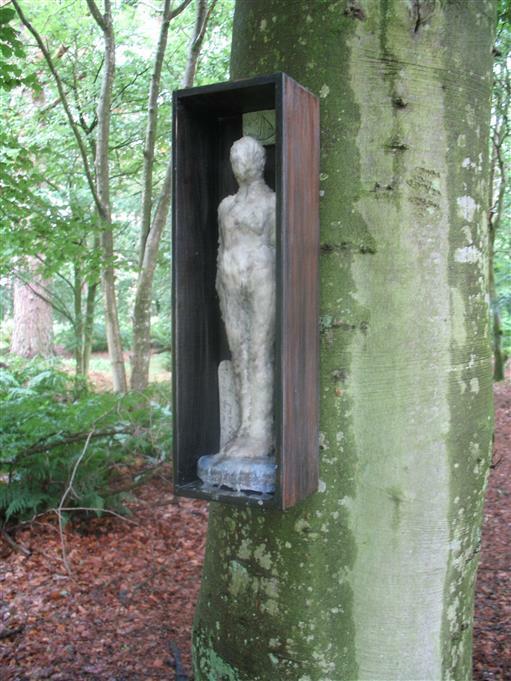 The figure can be seen as a religious artefact or as a reminder of the pureness within ourselves and the natural surroundings of the wood. Allowing space for contemplation and reflection the piece encourages consideration of the common place and how the meaning of place can change with the intervention of an overtly emblematic object. 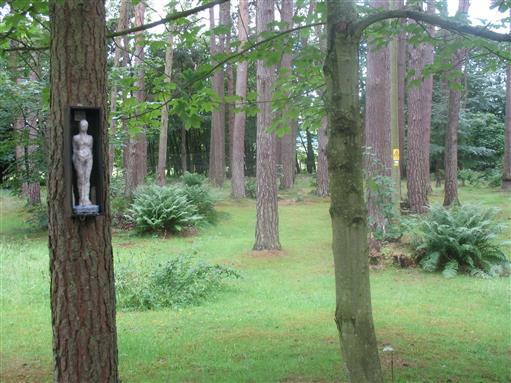 Monkquell wood was at one time, cultivated by the monks belonging to the Cistercian monastery in Coupar Angus during the 13th Century. The Cistercian monks were famous for their ability to reclaim and improve land, a heritage that provides the foundation for the fertile agricultural land of Strathmore. The monastery owned around 8000 acres of land in the surrounding countryside spreading wealth and plenitude to the provincial communities. By the Reformation, Coupar Angus was said to be the wealthiest Cistercian Abbey in Scotland.